Organic farmers may want to refine that manure before spreading it. Dale Overton, CEO of Over­ton Environmental Enterprises, urges organic farmers to add a composting step to their fertility programs, something he says will provide better long-term organic matter gain, fight off weeds and save money on fertilizer. Overton’s arguments echo advice from provincial Agriculture Departments and universities throughout Western Canada and the United States. A 2005 composting manual from Alberta Agriculture and Forestry (still cited by the University of Manitoba’s National Centre for Livestock and the Environment), pointed to less odour from composted manure, less manure volume and the benefit of more stable nutrients. But for organic producers, composting helps in their constant battle against weeds. Experts, including Overton, say the heat from composting is enough to kill many of the pathogens and weed seeds that might otherwise pass through raw manure and become a headache in the field. 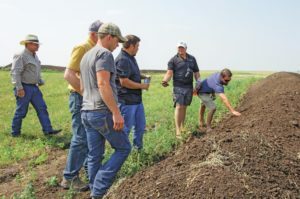 “The way you build compost is extremely important in the end benefits that the compost is going to give you,” Overton told a recent organic field tour. He advises producers to keep a close watch on both moisture content and carbon-nitrogen balance (25 or 30:1, carbon to nitrogen, he said, although provincial resources put the ideal ratio at the higher end of that range). Farmers can then add more straw to balance the mix, or clay or rock dust for better structure. Overton also warned against neglecting a windrow of compost. Material should be turned at least five times to properly kill pathogens and seeds, he said, and temperatures should be carefully monitored. “Once your temperatures reach about 160 to 170 F, you want to turn that and then you want to let that go sit for a week, a week and a half, and then turn it again and then progressively turn it as it starts to cool off a little bit,” he said. According to the University of Manitoba’s National Centre for Livestock and the Environment, compost needs to hit over 55 C (131 F) and stay there for 15 days to kill weed seeds and pathogens, plus 21 days of curing. While compost may have earned a slot on the list of best management practices, experts say farmers may still have to fight to get it working on a field scale. Time management, space and equipment are still obstacles for many. Nick Boundy of Boundy Farms says he has little advice for overcoming time-management concerns. The producer has several sets of compost windrows on his land west of Boissevain, including some held over from last year when the compost failed to complete in one season. Piling windrows before seeding may be a better recipe for success, he said, assuming the farmer has time. Boundy says he turned to compost as a fix for his soil biology, carbon and phosphorus balance, using manure from his own cattle herd. He brought in Overton’s company early on, hoping to get a better foundation on compost management. “It is important to monitor temperature and moisture and everything else and get a feel for what you’re doing,” Boundy said. “That’s the main thing. Don’t go in blind, otherwise you’re just going to have a pile of rotted manure. Other producers say compost may not fit their mode of production, even if time management was not an issue. Producers who have already turned to alternative winter grazing or summer mob grazing may rarely have animals in the corral, where manure and bedding can be gathered for compost. Blaine Hjertaas, a regenerative agriculture instructor and popular speaker on soil health and grazing systems, also noted the challenges, but argued that composting might be an alternative for farmers who are either unwilling or unable to integrate rotational or mob grazing.